In this article, we explain how to add the Book Now button to your website. We have two options for doing this depending on whether you’re using WordPress or HTML. Once you customize your Book now button, Orioly generates a code. This is the code of your CTA button that should be placed on your website. Copy the code and paste it into your HTML website. Paste the code exactly where you want your booking button to appear. This could be, for example, within or at the end of the article that’s describing your tour. Install the Orioly Book Now Plugin. Log in to your Orioly account, navigate to Settings > General Settings and click Copy to clipboard. 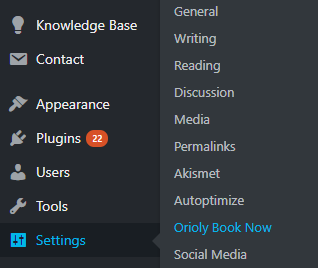 Log in to your WordPress account, navigate to Settings > Orioly Book Now. Paste the API key to Orioly Book Now API key blank field in your WordPress admin interface. Click Save. Go to any article you published in your WordPress admin interface and click on the Orioly Button just under the permalink. A drop-down window will list all your article titles. Choose the article you want to place the booking button in and then paste the API key into the article. Your booking button is now on your website where you want it. You can start promoting it on social media and receive bookings online!